There is one thing bureaucracies do better than any other organization, and that is keeping data series alive. I recently discovered the archives of the Highway Statistics series have been digitized by the Office of Highway Policy Information (OHPI). The first Highway Statistics, put out by the Public Roads Administration and Federal Works Administration in 1945 (pdf). Remember, they did this before computers, even before mainframes, so the staff effort must have been enormous. The full archives (pre 1995) can be found here. More recent statistics can be found here. 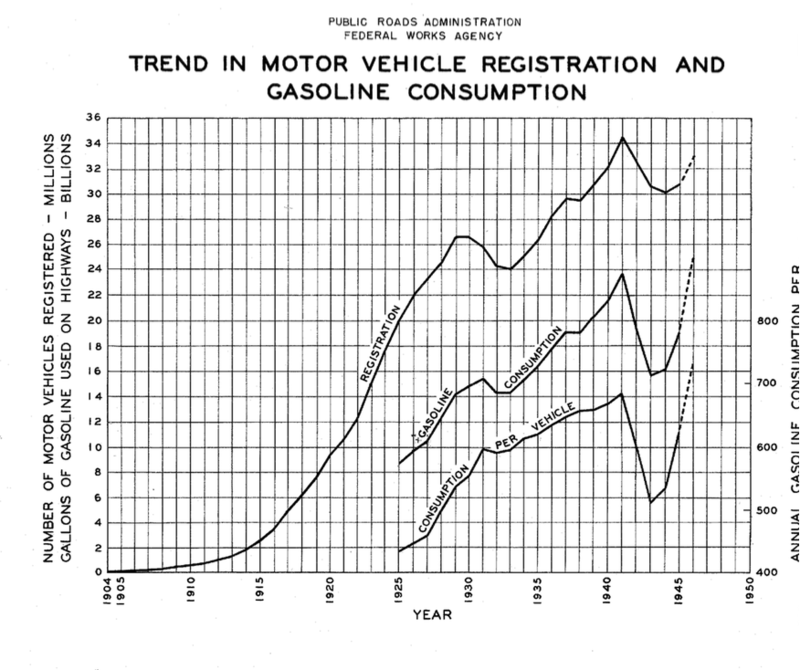 In 1945 gasoline consumption was about 22 billion gallons. Today that number is 169 billion. (7.7 times). Consumption per vehicle is about 667 gallons per vehicle today, compared with 647 in 1945. Of course fuel economy is up, as is miles per vehicle.